Currnt | Bank's Branch of the future ? Will they exist ? Bank's Branch of the future ? Will they exist ? With the things like digital transformation and app-oriented environment, we see fewer operations in the branches for routine banking. What do you think the role of the branches in future? Is this right to say that we might need branches ( or small branches) from 10 years from now? Yes despite the digital transformation branches will be still needed for routine banking. Not everyone has neither access to the web nor the skills to handle on this about business or routine acts. Highly likely in 10 years the number of the branches and the employees will decrease but these are still fundamental. Maybe not just one but few yes. Or maybe help with a remote access to your devices. Ideally, with the available and projected technology and social behaviors, the consumer banking should be all migrated to branch-less banking. There is a lot more fruit for unconventional banks in the retail and consumer banking side, such as banks with telecom as their core business and micro-finance networks rather than existing large retail banks, unless they tailor their existential reasoning. On the other hand, corporate banking will remain the shop-based mechanisms with a lot of expected disruption but on a different scale. Therefore, nature of bank branches will be different as they'll not be required to facilitate the payments as they are required now but may be in the form of a regional cluster office with specified numbers of agents, terminals and digital-branches substantially cutting the cost of maintaining the branches but also giving more penetration to the masses. Although the bank branches are important now in my opinion it may slowly diminish over a period of 10 or 20 years. Due to internet, mobile banking and several other mobile wallets it has become easy to maintain, transfer, purchase, pay, receive or do any kind of money transaction online. So, yes, the branches will definitely diminish in future. However, it will be required in the rural areas and places with poor internet connections. Just to add few more use cases - Are we imagining future branches are like a one man office, who is just helping you assisting the digital tools? Imagine human less billing counters at Walmart. I think branches will remain but in a different shape. May be - few people to provide digital assistance. Bank branches will continue to serve persons with technical aversion, and for those who still require or enjoy personal interaction. I fully agree that the number will greatly diminish and the services provided will shift, but they will persist in some form to address particular needs. For instance, more branches inside grocery stores rather than free standing as is current. In my opinion the whole financial business will be diversified into two groups, (i) With branch and (ii) branch less. For example, credit card transaction that does not require any in-person transaction or deposition can be run through branch less, whereas banking system that requires in-person deposition will operate with branches. As many have already suggested in their responses, the nature of services in bank branches will clearly evolve, and the numbers of branches may change. I feel the need for personal services is on the rise, but not the need for mechanical aspects of banking (making deposits and obtaining loans), as those increasing can be handled on line by all of us on our cell phone. So perhaps this is an opportunity to redefine the service model of branch and community banks--tuned to the evolving needs of the market segments in which these banks are located. A broad menu of micro-services helping communities with unique financing needs, assisting people with debt management, providing tax services, and helping retired people manage their finances in a way that will extend their independence...may be a few key areas to explore. Just as the rotary telephone of the past outlived its relevance, the telephone also created a whole new world of connectivity via cell phones. Perhaps branch banks can be a launching platform for needed services we have only begun to imagine. Banks will have branches for several reasons. There is no arguing that many of the most basic branch transactions of the past are now handled outside of branches. and that most of us find more convenient to manage the basic banking operations in a self-service mode. Yes, the banks need to keep serving people with adversion for the technology or in rural no well served zones and for very specific banking services which cannot be accessed remotely. They will also keep the branches in the centers of the cities to create a new very different point of contact with their customers, a kind of showcase of what their services are and will be and a way to create a different kind of relation with current and future customers. But, above all, there are few elements of our lives more personal, or of greater importance to us, than our finances. As humans we want touch points and access to the company and people we trust with our money . 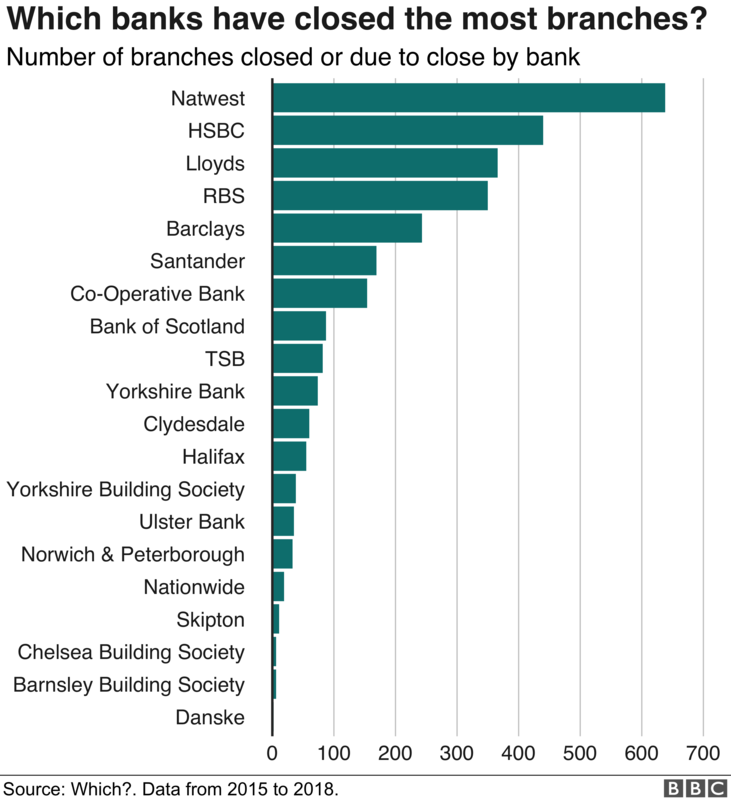 Customers do not really want physical access to branches, they want physical access to bankers...Which are still kept in the branches. The Wells Fargo account fraud scandal is an ongoing controversy brought about by the creation of millions of fraudulent savings and checking accounts on behalf of Wells Fargo clients without their consent. Various regulatory bodies, including the Consumer Financial Protection Bureau, fined the company a combined $185 million as a result of the illegal activity, and the company faces additional civil and criminal suits. Branches will exist maybe not the way we see today. Smarter and more automated. "Bank" is trust and trust in humans need a human touch. As per RBS - "Since 2014 the number of customers using our branches across the UK has fallen by 40% and mobile transactions have increased by 73% over the same period". I think small branches used for small investors are impacted because of digital banking growth. In future bank branches shall only deal with consulting with customers when they are in any difficult situation while dealing smart activities. They will convince customers about business what should be adopted for more benefits. WELLS FARGO BANK and Horses?